Small and medium-sized industries (SMEs) should focus on accelerated innovation to sustain competition and growth, and to move up the value chain to become a high-tech industry and world player. This was expressed by Prof Tan Kim Hua, Professor of Operations and Innovation Management in the UK Nottingham University Business School, during his public lecture on “Accelerating Product Innovation in a Big Data Environment” at the WOU main campus today. About 70 people attended the talk organised by the School of Science & Technology. He said SMEs should not just do R&D for product innovation but also have a business model to capture and sustain the market into the future, like IP protection and launching fast to prevent sabotage from big companies. A section of the crowd attending the lecture on product innovation. He stated that new products have a remarkably high failure rate of 50% or more, and advised SMEs to make their innovation more structured, accelerated, efficient, low cost, low risk and less uncertainty. Prof Tan shared two case studies of successful accelerated innovation by SMEs, i.e. the levelling tool and smart luggage lock, utilising existing technology to add value to the products. Prof Tan advised on two innovative products developed by an SME. The second was eGeeTouch, world’s first smart luggage lock, which offers multiple access methods via NFC smart tag, NFC-enabled smartphone, NFC-enabled smartwatch, and so forth, with patents in the US, EU, Japan and China. He is currently looking at other end-of-life products, like hammer and items in the house. With value creation, innovative products can command a higher price. He said innovation must lead to high value creation, with the Amazon retail price of Digi-Pas approximately 4-30 times that of traditional bubble sensor levelling tool, while that of smart luggage lock approximately 7 times more than conventional luggage lock. His advice to SMEs: Choose a simple product aligned to your business direction and having well-known market size; use existing technology to radically differentiate it; assess the value creation; have IP protection by securing patent at strategic markets; and launch the new product fast. Prof Tan with School of Science & Technology Deputy Dean Assoc Prof Dr Lee Chee Leong (left) during the Q&A. Prof Tan highlighted that big retailers often refuse to carry the new products, but today there is the option of e-commerce to sell online through channels like eBay and Amazon. During Q&A, he said consumers will not mind paying more if there is added value and it can benefit them. He replied that they target high-end users for their smart luggage lock, adding that the retrieved data of smartphone numbers and the airport/resort used can be captured, and they might switch to selling these data in the future. 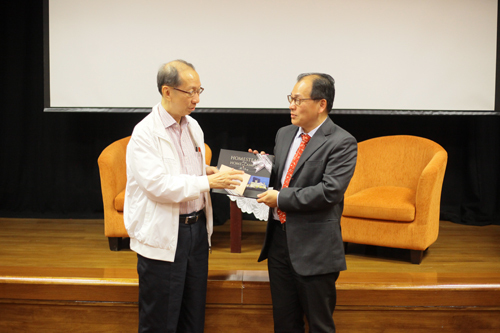 WOU Board of Governors Chairman Tan Sri Dr Koh Tsu Koon (left) presents a token of appreciation to Prof Tan. As for service industry like education, he remarked that some features of accelerated innovation are still applicable like identifying what is of value to customers, and incorporating this to significantly transform the programmes or services offered to students.